Marvel Comics asked Ta-Nehisi Coates, The Atlantic national correspondent and National Book Award winner, to write a storyline for Black Panther. In this episode, Black Panther’s surrogate mother, Ramonda, walks closer to death as her injuries from a bombing worsen and recovery is starting to seem like an impossibility. Plus: Shuri, Black Panther’s sister returns from the Djalia…but is she still herself? Something more? Or something of LEGEND? 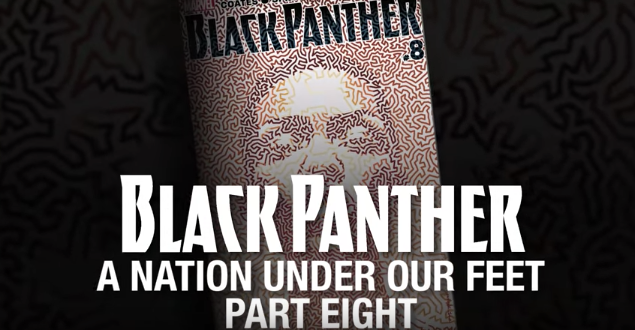 Continuing the excitement surrounding Marvel’s celebrated Super Hero T’Challa, the Black Panther, the latest episode of this revolutionary multi-artist hip-hop-inspired video series samples a brand new track, “100 Black Panthers” by Kipp Stone.